disdressed: What would you do? Oh my gosh, it's working! I'm holding my breath here, so let's make this a short post, shall we? Let’s just imagine that you have some very dear friends who love bunnies and have a small collection of cute little rabbit dolls. 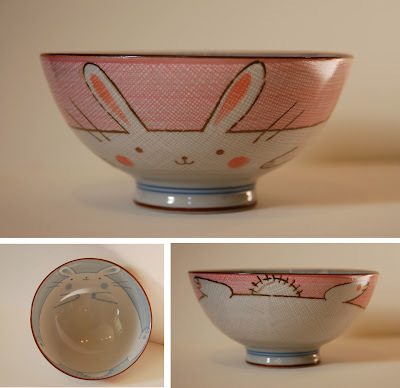 And let’s say you come across this cute little bunny bowl while browsing at Pearl River Mart one day. And let’s say you buy that bowl with the idea that you’ll build a Christmas gift based on it. What would you do to complete the gift? 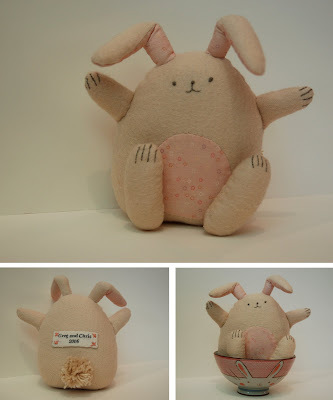 You’d make this bunny, right? She’s made of natural-colored cotton flannel with a really subtle pink print from Purl’s collection for the belly and ears. She sits right inside the bowl for a little gift basket-style gift. We all liked the result enough that I’m making another for the Kiddo. oh, i would like to think i would have done exactly that, as it is perfect. so perfect! your friends will be thrilled. both bunny & bowl are extremely cute! this bunny definitely made me smile. :) great gift! That is absolutley precious. Both the bowl and the bunny perfect combination! I'd *wish* I could do that - that's what I'd do. It's fabulous! 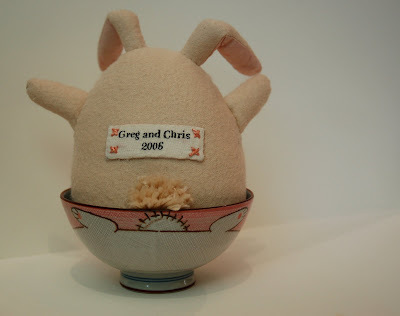 I have an older friend who loves bunnies, that i now have to go and make this myself, and stop at Purl River mart to find the bowl. Oh what a wonderful idea, and the bunny is so adorable. I am sure your friends will absolutely love it. This is adorable and that is my favorite store it find inspiration! Sooo cute! I saw those bowls a while back at Pearl River Mart too and was so tempted to buy them. WOW! This is so cute and what a great idea!